Mountaineer and climbing mentor, Liz Rose, is on a quest to climb the highest mountain on each continent, commonly known as “The Seven Summits”. At the ripe age of 25, Liz has already summited Kilimanjaro, Everest, Aconcagua and, most recently, Mt. Vinson in Antarctica. 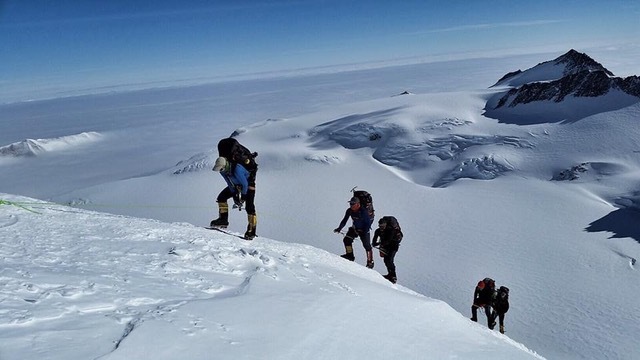 She is on track to become the youngest Canadian to climb all seven with her sights set on summiting the remaining three within the remainder of the year: Denali, Elbrus, and Kosciuszko. Liz grew up on the West Coast of British Columbia with a love for adventure and the outdoors. Her Seven Summits journey began in 2015 when she summited Kilimanjaro alongside her father. Climbing to the "Roof of Africa" introduced Liz to the high of being in the mountains and she was hooked. Her next mountain adventure came shortly after with her mother - they trekked to Everest Base Camp in Nepal together. Liz recalls this as, “the trip where I completely fell in love with Everest and the idea of conquering the Seven Summits.” Since then, Liz has gone on to climb Aconcagua, the highest peak in South America and, notably, on May 23rd 2016, she became the second youngest Canadian to summit Everest (the North side from Tibet). Liz has shared with us some amazing photos and stories from her most recent summit, Mt. Vinson. Please click through the photopanel below to read about her climb up the highest peak in Antarctica. Congratulations on your fourth Summit from your Mountain Mentors family, Liz! We can't wait to watch you bag your final three. Our journey began with a four and a half hour flight from Punta Arenas, Chile to Union Glacier, Antarctica. After landing on a runway completely covered in blue ice, we boarded a twin otter ski plane for a short flight to Vinson Base Camp. We slept at Vinson Base Camp for two nights to organize gear and go over the route plan. 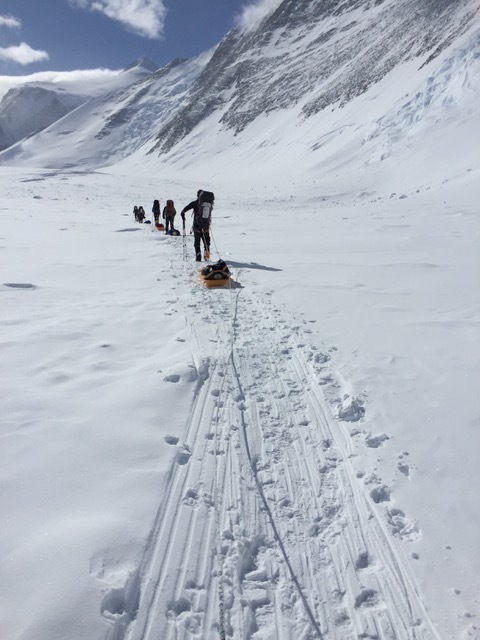 We set out the following morning on the gradual climb to Low Camp with our gear dispersed between our packs and our sleds. After a long day of traveling the glacier, we were pleased to set up our tents and eat some warm food. At this point, we were completely disoriented by the 24 hours of daylight during the summer months in Antarctica. The next day we carried our first load of gear to High Camp. We returned back to Low Camp to eat, hydrate, and take 24 hours of rest. After our rest day we packed up and repeated our journey. Unfortunately this time we were battling frigid temperatures down to -30 degrees Celcius. After one nights sleep in High Camp, the team was feeling strong and ready for our summit push. The weather looked promising so we left early that morning. Both of our rope teams kept a solid pace and we were able to reach the Summit Ridge in perfect weather. All smiles on summit day! We climbed down to our final night at High Camp and safely returned to Base Camp the following day. Also, follow along with her journey and show your support on her Instagram! Go Liz!